Use these deeper and larger boxes when standard boxes aren't large enough. Junction boxes come in many shapes and sizes. Depending on what sized wire, how many wires are in a given box and the number of wire splices in that box, you may need a little more room than a standard box can give you. You may have to opt for a deeper or larger box to accomplish the splicing you have planned. Then again, you may need both a physically larger and deeper box for the electrical job that you are working on. Each electrical project has its own specific needs of electrical boxes. Some may require square, octagon, metal, or plastic boxes. Your project may be a new installation or a remodel job. There are specific boxes for each of the choices and they both have options to accommodate the space you need to place the right amount of wiring within them. When choosing the right sized box, consider the size of wires that you will be installing in the box. Obviously, if the wires are #14 or #12 non-metallic sheathed wires, there should be more that enough room for a few of them in a standard 4" box. However, if you have a few #6 wires in the same box, it can become very crowded quickly. I this case a 4" deep box, or better yet, a 4 11/16” box is likely your choice. It gives additional room width-wise and is a deep box. What's the Difference in Box Sizes? The box on the left, in the picture, is a standard 4" box. It is 1 ½” deep box that is made out of metal. 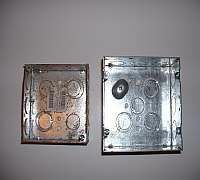 On the right is a 4 11/16" wide box that is 2" deep and is also made of metal. You can see how much more room this box provides for splicing electrical wires. By increasing the width, the area of room increases. This can also be increased by choosing a deeper version of each of these electrical boxes. By allowing ample room in boxes for spliced wires, you eliminate the possibility of pinching a wire between the box and cover plate. Besides the wires themselves in the box, there are also usually wire nuts to make wire connections. These connection joints also require additional room in the junction box, so keep that in mind when planning the project at hand. Your junction box may also have a ground strap wire and a grounding connection in addition to the "hot" and "neutral" connections.There is also the possibility of having a connection within the junction box like a door bell transformer. It also takes up valuable room. As you can plainly see, there is more to choosing the appropriate sized junction box than just going to the store and picking the first electrical box that comes along. Look over your electrical project and choose wisely.